Fig at Courtney's House is located at 311 6th St. in Templeton and open Monday through Saturday from 9 a.m. to 3 p.m. Founded in 2016, the nonprofit's mission is to provide job training, employment, and a safe community to adults with developmental disabilities. Visit figgoodfood.org to donate or learn more. Stationed on the front porch of a striking Victorian house off of Main Street in Templeton is a small white host's desk. An attached chalkboard displays the day's soup specials. Depending on the day, a smiling Leslie Madruga might be standing behind it to greet you. Or it maybe it's Heather Joannes, with her signature exuberance, who's showing you inside for a meal. SERVICE EXPERIENCE Leslie Madruga (center left) serves lunch to customers at Fig at Courtney's House. 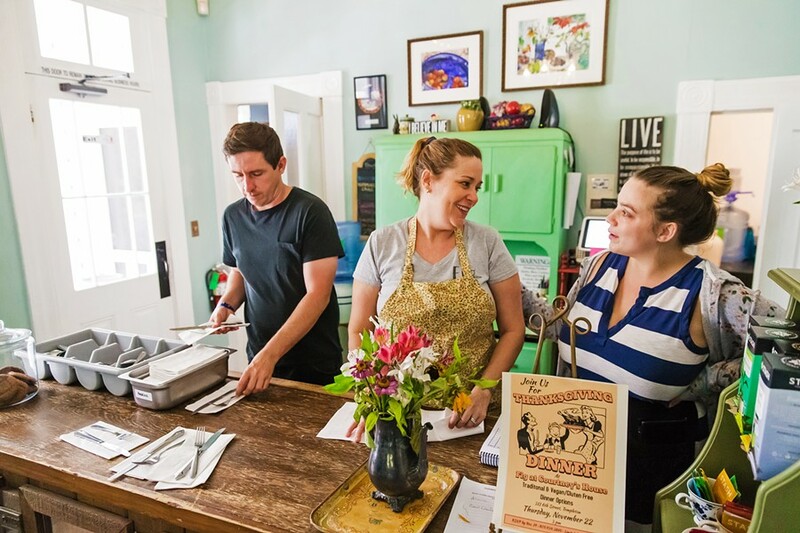 The nonprofit restaurant in Templeton provides job training, employment, and community to adults with disabilities. Fig at Courtney's House is a unique kind of restaurant. Not only for the tasty food it serves and its cozy setting in a historic house. But as a place whose mission is to provide adults with developmental disabilities opportunities for restaurant job training, employment, and community. "Talking with other parents, I just kept hearing about the need for job training and jobs," said Carrie Sanders, founder of the nonprofit restaurant, whose daughter, Courtney, 25, has autism. "We were looking for a job training program for Courtney, and she just wasn't finding anything. ... We need more options." Since opening its doors in 2016, Fig has offered an alternative to some of the job programs that have been traditionally available to intellectually disabled workers in SLO County. Those could include shifts at a thrift store for $4.15 per hour, or maybe repetitive piece-work tasks, like packaging or paper shredding, in sheltered locations for wages that can dip below $1 per hour. A different option is what brought Heather, a 33-year-old with a developmental disability, to Fig at Courtney's House 2 1/2 years ago. She came in the wake of a traumatizing experience working under illegal subminimum wage conditions in an electronic waste recycling facility in Paso Robles. For many intellectually disabled individuals and their families, navigating employment can be one of the most challenging aspects of life. Finding work that suits them and aids their growth is often fraught with obstacles. People and families can get lost in and at times harmed by a byzantine system of services, agencies, and laws meant to support them. "The whole system is such a confusing, conglomerate mess that it's literally impossible to navigate," said Joyce McPherson, whose daughter, Olivia, is on the autism disorder spectrum and employed in North County. "In the end, most parents with young adult children find there is no help available, that it all seems to end up working against them." Nationwide, a wave of advocacy is underway to change societal attitudes, laws, and services to better help and empower adults with disabilities. Central Coast Rep. Salud Carbajal (D-Santa Barbara) recently co-sponsored a bill that would abolish subminimum wage practices. Service organizations across California are shifting their models toward inclusive, community-based employment. While the institutional gears slowly turn, individuals and families continue to grapple with the pitfalls of an old paradigm. 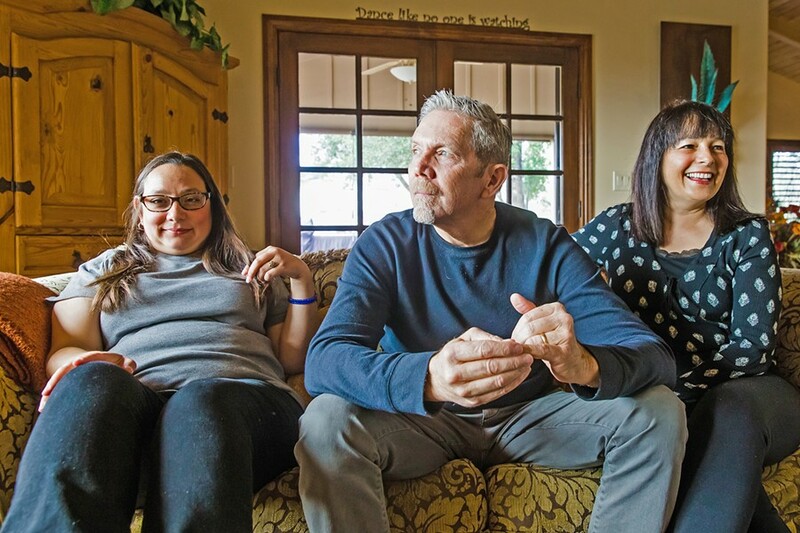 Before Heather Joannes was that bubbly person behind the host desk at Fig, she and her family experienced what they called the darkest times of their lives, as clients of NCI Affiliates, a Paso Robles-based nonprofit. Founded in 1979, NCI provides a variety of services, including employment, to hundreds of adults with disabilities in SLO, Santa Barbara, and Monterey counties. Heather worked with NCI for several years as a young adult—cleaning bathrooms at Camp Roberts, among other jobs. Like many workers with developmental disabilities, Heather was paid below minimum wage: less than $2 per hour. Subminimum wage is a legal practice in the U.S., enabled through the Fair Labor Standards Act (FLSA) of 1938. A FLSA provision, Section 14c, allows employers to receive certificates from the U.S. Department of Labor to pay subminimum wages to workers with disabilities. The idea behind it is to compensate the worker to a level commensurate with their productivity, which in many cases is lower, due to their disability. FAMILY SOLIDARITY Heather, Tim, and Nitzi Joannes (left to right) had a disturbing experience with subminimum wage employment in 2015, when Heather, who has a cognitive disability, was paid less than minimum wage at a business that was unpermitted to do so. Their ordeal led to a lawsuit and federal investigation into the wage practices at Paso Robles' NCI Affiliates. A worker's wage is calculated with a time test. First, someone without a disability is timed doing the job task(s). Then, the employee with the disability is timed after thorough training. The employer compares the two times, and adjusts the disabled worker's pay to a proportionate value below minimum wage ($11 to $12 in California). In April 2018, SLO County had 240 individuals with disabilities earning an average wage of $4.36 per hour at 28 work locations with active Section 14c certificates, according to Department of Labor records. Those records state that NCI Affiliates and its sister nonprofit, Achievement House, were the only two employers to have active Section 14c certificates in SLO. Other comparable nonprofits, like PathPoint and Options Family of Services, also use subminimum wage certificates, but didn't have active ones at the time of New Times' record request. All four organizations have ample financial resources, fueling concerns about their clients' low wages. In fiscal year 2016-17, NCI and Achievement House operated on combined $10.7 million budgets and held $17.4 million in total assets, according to ProPublica's Nonprofit Explorer. Santa Barbara-based PathPoint, which operates in five counties, worked with a $22.7 million budget and $10.4 million in assets in 2016; that same year, the Morro Bay-based Options had a $5.8 million budget and $2.5 million in assets. While Heather's pay always made her parents, Nitzi and Tim Joannes, uneasy, they tried to accept it and focus on the positive: Heather had a job. "We were never happy about the money, but we were happy she had a job," Tim told New Times. "It's a tough predicament, and that's the predicament many parents are put in." Their trust would soon start to erode, however, when in 2015, Heather started a new job at NCI packaging orders for a protein powder company, Click. Heather started out earning $4.50 per hour, but, as the family would later find out, neither organization held a Section 14c certificate to pay subminimum wage there. According to NCI's Senior Regional Director Traci Hollinger, Heather's job coach at the site incorrectly placed her there, and the mistake was only later realized by NCI staff. Shortly before a scheduled meeting to discuss Heather's first three months on the job between the Joannes' and NCI, NCI allegedly moved Heather into a different job, where she was time-tested at tasks she hadn't been doing or trained in. After she performed poorly, NCI allegedly told Heather and her parents that she would have to be terminated from that job. The incident spun Heather into a state of confusion and distress, and sent her parents on a search for answers. Tim and Nitzi spent months trying to piece together what occurred, reaching out to state and federal agencies trying to find someone who understood the system and could help, often unsuccessfully. "My stress level was so high trying to figure out just exactly what happened," Tim said. "How does Heather get put in a position she's never worked, get a timing done on that position, and then lose her job essentially because of that timing? Nobody could tell me." Heather ultimately filed a civil lawsuit in SLO County Superior Court against NCI and Click for wrongful termination, disability discrimination, failure to accommodate, intentional infliction of emotional distress, and seven other alleged labor law violations, according to court records. The parties settled the case in 2017. For Heather, the experience caused a prolonged period of depression and unemployment. "Heather's like every other person. What does unemployment look like to you?" Tim said. "She lost her sense of value, her sense of being, her sense of community. She was just crying ... like, 'Why did they do this to me?'" Her case drew the attention of the Department of Labor, whose Wage and Hours Division investigated two of NCI's sites in Paso Robles for their compliance with labor laws. The review concluded that a worker (Heather) had been paid below minimum wage at an establishment that wasn't permitted to pay it. It also found that 22 other individuals with disabilities had been underpaid due to incomplete time testing procedures at the two locations. In total, NCI paid $19,583 in back wages to the workers covered in the investigation. No additional penalties or fines were levied. Hollinger said that today NCI conducts more frequent site checks to oversee its staff and operations and that it's reformed its time-testing procedures to encompass all work that's performed. Heather's not the only individual with a disability to experience alleged mistreatment in one of SLO County's employment service organizations. Olivia McPherson, 19, who's also on the autism spectrum, said her job developer at PathPoint caused her severe distress through actions like turning in the wrong resumé to an employer, filing paperwork late, and lying on multiple occasions, she said. "It was just so blatantly unprofessional. I've never dealt with misconduct on this level before. It was a huge breach of trust," Olivia told New Times. "I've had times in life with teachers not understanding my autistic and ADHD symptoms, which is understandable because they might be just ignorant. But [PathPoint] is for people with developmental disabilities." Her mother, Joyce, an Atascadero State Hospital employee, said upsetting experiences like that are especially detrimental to someone already coping with a cognitive disability; it can set their progress back significantly. Then, understanding what happened and finding a resolution is also taxing, and often requires a parent or advocate to step in to navigate the groups and agencies involved. "It can derail months of work that a parent or individual puts in through a therapist, developing coping skills, ways of de-escalating emotions," Joyce said. "It can be washed down with one person who is supposed to be a professional looking out for her best interest, but instead sends them miles back in the process of trying to become a successful, productive member of society, which is their right." Both families hope their experiences shine a light on a system in need of change. "They're already at a disadvantage," Tim, Heather's father, said. "We should never have a situation that we potentially put them at a greater disadvantage." For years, disability advocates have lobbied Congress to repeal Section 14c of the FLSA, arguing that subminimum wage jobs segregate, stifle, and potentially exploit people with disabilities. One of those voices pushing for change is Ashley Romero, a third-year Cal Poly student with cerebral palsy, who's hoping to use her career to help and empower the disabled community. "I believe that everyone should be paid at least minimum wage, regardless of their disability or limitation," Romero said. "It is unfair to pay someone less than the minimum wage just because of limitations that they were born with." Already this year, two bills were introduced in Congress that would gradually raise the floor of subminimum wage over six years until it's completely phased out. One of them, the Raise the Wage Act, is co-sponsored by Rep. Carbajal. "This is yet another step forward in creating an even playing field and fair compensation for everyone," Carbajal told New Times. "To not do that is not the American way. We are a country that prides ourselves on fairness and ridding ourselves of discriminatory practices." While the Raise the Wage Act also includes increasing the overall federal minimum wage to $15, another new bill, the Transformation to Competitive Employment Act, targets Section 14c. A Jan. 30 press release on that bill says that 420,000 individuals with disabilities nationwide are working for an average wage of $2.15 per hour. But despite its support from advocates, ending the practice has complicated consequences that raise concerns and questions. If a business can't afford to accommodate and pay minimum wage to an employee with a disability, has that individual then lost the chance to work at all? "What scares me in the long term is if an individual's severe disability really prohibits them from having an opportunity to get a job out in the community, and employers aren't allotted to use this special certificate, and that individual really wants to go to work, they don't get to. That chance has been removed from them," Hollinger, with NCI, said. INCLUSIVE WORK Juston Saylor, Erin Babcock, and Megan Toohey (left to right) prepare napkins and silverware for customers at Fig at Courtney's House. The 3-year-old nonprofit in Templeton provides restaurant job training, employment, and community to adults with developmental disabilities. The debate gets down to the meaning of a job and a wage. There are those who argue that, in some cases, the value of a work experience is as or more important than the value of a paycheck. If a job empowers an individual and aids their growth, but pays below $12 per hour, some feel it's still a worthwhile option. The leaders of Fig at Courtney's House are sympathetic to this, as they look at the financial realities of running an independent restaurant. As a job training program by definition, Fig pays its interns a stipend that calculates out to less than minimum wage. But Fig also hires employees with disabilities who earn minimum wage. If the restaurant paid every participant in the program minimum wage, the balance book would move into the red. "I would love to hire any intern, but we have to have the finances to do that," said Carrie, Fig's founder. "It definitely needs to be explored: How can we address this in a way that works for employers but also makes the individuals feel valued? It's a huge dilemma." Individuals with disabilities and families also have valid concerns about how full wages can impact Social Security and health care benefits. Depending on the benefit and situation, a worker could lose their assistance or see it reduced because of the higher wage. In one case shared with New Times, an individual whose pay jumped up to minimum wage ended up owing $6,000 back to the Social Security Administration. Making sure one source of income doesn't affect the other is a constant challenge. While advocates and lawmakers in Washington, D.C., continue to debate the future of subminimum wages, California agencies and organizations are taking steps to evolve their services toward an "employment first" model. The model is about making investments in teens and young adults with disabilities to help them gain the skills and training needed to successfully integrate into the workforce. Each individual is consulted through "person-centered planning" to get them on an employment path that works for them. Romero, the student at Cal Poly, is a beneficiary of one of these new programs. While she pursues her sociology degree, Romero also works as a paid instructional aide at Cuesta College, assisting with an academic fundamentals class that helps students with disabilities explore and attain their life goals. She found the opportunity through the Tri-Counties Regional Center and its new paid internship program, which enables individuals it serves to participate in a fully funded minimum wage internship at virtually any willing employment site. For Romero, the instructional aide experience at Cuesta fits perfectly into her future plans. CHASING DREAMS Third-year Cal Poly student Ashley Romero (center right), 23, who has cerebral palsy, is helping adults with disabilities find their paths as an instructional aide at Cuesta College. 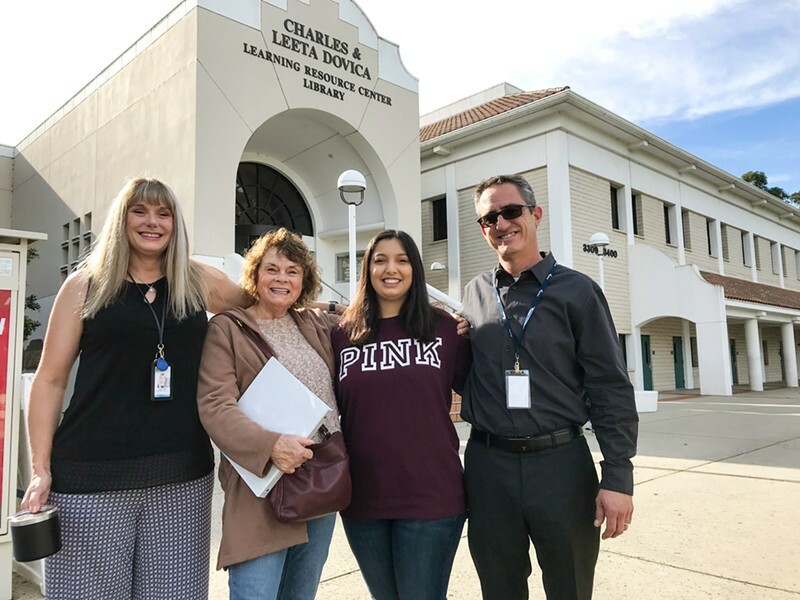 Here, she's posing with Joey Carroll, a Tri-Counties Regional Center employment coordinator; Carol Lopes, a Cuesta College instructor; and Jeffrey Waggoner, a PathPoint employment specialist (left to right). "I'm really liking communicating with students with all types of disabilities. I try to help them speak up for themselves and fight for their accommodation," Romero said. "I want to be able to give back." Dozens on the Central Coast are now taking advantage of the internship program—which has a post-internship employment rate of 80 percent, according to Tri-Counties—through employers like Fig, Cuesta, KCBX, Sports Warehouse, and the Wallace Group. The trend points to the shift in priorities and values taking place in the field. The legacy nonprofits, like NCI and PathPoint, are also emphasizing their efforts to move away from old-school menial jobs and toward inclusive employment. PathPoint told New Times it plans to cut out all subminimum wage employment in SLO County in 2019. NCI said it's "looking towards eliminating the 14c process as we move individuals into competitive integrated employment."